When I was kid, many MOONS ago, I enjoyed a lot of the Chef Boyardee products. I guess it added to my “mass”… HAHAHA, anyway, one day out of the blue I made for Magda a similar creation, of Beef-A-Roni… and its literally become one of her favorite meals. And its relatively easy and FAST to make… a key element in the Magda Cooks Project… lets do it! Start by getting a pot of water going for your pasta, as this is a quick meal, I'd say max 20-25 minutes total. I usually toss 2 mushroom bouillon cubez into the water for about 400-500g of pasta. 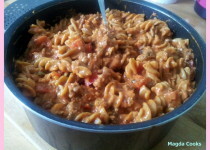 While this is ongoing, get your favourite pot that can handle both the sauce and the pasta together. That is IMPORTANT. Using NO ADDITIONAL OIL, as in NONE, toss the meat mix into the pot. Season liberally with the yellow poison or meat seasoning, or just salt, the black pepper, oregano, basil, and garlic salt. Season to your normal liking. Get either the mushrooms (that you cut and dice) or the other bouillon cube and toss it in as well. Let it brown, and mix together over medium heat. Dice the onions and pepper. Once the meat IS nearly browned, toss the onion and pepper in. By this point your water should be boiling. Toss your pasta into the boiling water. Cook the meat, onion, pepper, (mushrooms) mix for about 4 minutes, or until the onion is clear. Then, add the diced tomatoes and concentrate. Mix again. You may need additional seasoning at this point. Add the brown sugar. Cook another 4 minutes or until boiling. Then add the ENTIRE amount sour cream, and 50 dg of the grated parmesan cheese. Sit thoroughly until its all mixed and the sauce has a steady and blended consistency. The pasta should be done at this point, so drain it. Your sauce, should also be done at this point. Toss the pasta into the sauce mix at 50% pasta, stir and toss, and then the remaining amount. Stir and toss again. Serve.